Minarik Drives' XL3050A filtered pulse-width-modulated (PWM) variable speed DC drive provides exceptional performance. It outputs nearly pure DC power to brush-type motors ranging from 1/20 to 1/2 HP. The drive accepts 120 or 240AC input to output 0-130 or 240VDC, respectively; resulting in higher speeds from standard 90 or 180VDC SCR duty motors. This innovative technology lets users operate many low voltage motors with only minor calibration adjustments. MOSFET power devices switch at 22kHz, which is above the audible range, to provide fast circuit response and a constant 1.05 form factor over the entire 100:1 speed range. Highly efficient XL3050A drive provides cool,quiet motor operation with extended brush life and low maintenance. For convenience, the drives have a cage-clamp terminal block to make wiring easy. User adjustable calibration pots: IR compensation,min speed,max speed,current limit,acceleration and deceleration. 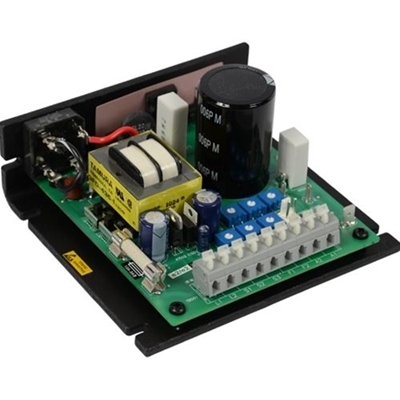 Additional features: Dual voltage AC input,DC field supply and on-board line fuse.